The pack of riders cycles during the 15th stage of the Tour de France Sunday from Bourg-en-Bresse to Culoz, France. CULOZ, France — Chris Froome has been so strong on this year’s Tour de France that at times he appears to have been toying with his rivals. He was at it again on Sunday in the final climb of the 15th stage won by Colombian Jarlinson Pantano, the Briton launching a fake attack, briefly accelerating just to check who was ready to follow him. “It was just to see who had the legs,” Froome, who still leads Dutchman Bauke Mollema by 1 minute, 47 seconds, told a news conference after a trouble-free day that featured six climbs. “I wanted to see exactly what the state of play was, to see what reaction I’d get, who would be following me, who might be making a move over the top,” the Team Sky rider added. 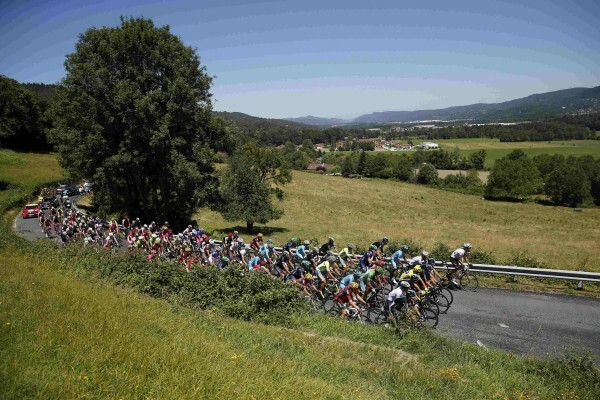 The 160-kilometer stage in the Jura mountains, which included some tricky descents, was an opportunity for Froome’s rivals for the yellow jersey to launch some attacks. Some, like Fabio Aru, Alejandro Valverde and Romain Bardet, tried, but failed as they were reeled in by Froome’s relentless Sky teammates Mikel Nieve and Wouter Poels when they made their moves in the final ascent. “They set a hard tempo on the last climb. Anyone who is attacking they just bring them back,” said third-placed Adam Yates, the Briton who trails Froome by 2:45 and was seen struggling at the back of the favourites’ group. “Aru, Valverde had a go and apart from that Romain Bardet gave it a try over the top but I had the feeling everyone was at the limit and no-one had the legs to make a big difference,” said Froome, who looked totally in control throughout. The defending champion, looking to become the first rider to retain his title since Miguel Indurain in 1995, can rely on an exceptionally strong team. “I have such a strong team, the strongest I’ve ever had in the Tour de France, and guys who would be leaders in other teams… Wouter Poels, he’s not just any rider, he won Liege-Bastogne-Liege (one of the top five classics in the world),” he said.